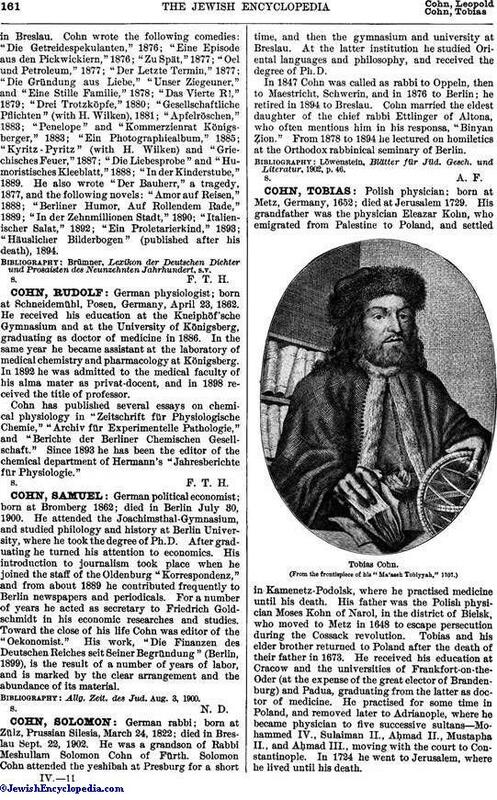 Polish physician; born at Metz, Germany, 1652; died at Jerusalem 1729. His grandfather was the physician Eleazar Kohn, who emigrated from Palestine to Poland, and settled in Kamenetz-Podolsk, where he practised medicine until his death. 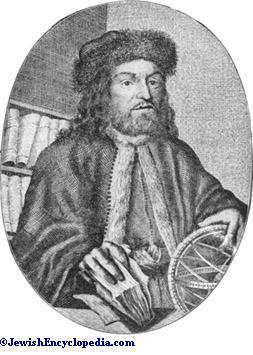 His father was the Polish physician Moses Kohn of Narol, in the district of Bielsk, who moved to Metz in 1648 to escape persecution during the Cossack revolution. Tobias and his elder brother returned to Poland after the death of their father in 1673. He received his education at Cracow and the universities of Frankfort-on-the-Oder (at the expense of the great elector of Brandenburg) and Padua, graduating from the latter as doctor of medicine. He practised for some time in Poland, and removed later to Adrianople, where he became physician to five successive sultans—Mohammed IV., Sulaiman II., Aḥmad II., Mustapha II., and Aḥmad III., moving with the court to Constantinople. In 1724 he went to Jerusalem, where he lived until his death. Cohn was familiar with nine languages-Hebrew, German, Italian, French, Spanish, Turkish, Latin, Greek, and Arabic. This great linguistic knowledge made it possible for him to write his "Ma'aseh Tobiyyah" (Work of Tobias), published in Venice in 1707, and reprinted there in 1715, 1728, 1769, and 1850. The work is encyclopedic, and is divided into eight parts: (1) theology; (2) astronomy; (3) medicine; (4) hygiene; (5) syphilitic maladies; (6) botany; (7) cosmography; and (8) an essay on the four elements. 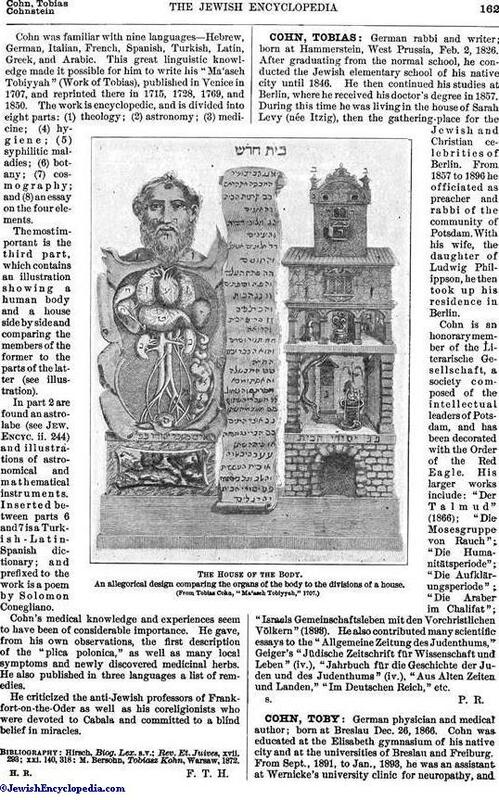 The most important is the third part, which contains an illustration showing a human body and a house side by side and comparing the members of the former to the parts of the latter (see illustration). In part 2 are found an astrolabe (see Jew. Encyc. ii. 244) and illustrations of astronomical and mathematical instruments. Inserted between parts 6 and 7 is Turkish-Latin-Spanish dictionary; and prefixed to the work is a poem by Solomon Conegliano. Cohn's medical knowledge and experiences seem to have been of considerable importance. He gave, from his own observations, the first description of the "plica polonica," as well as many local symptoms and newly discovered medicinal herbs. He also published in three languages a list of remedies. He criticized the anti-Jewish professors of Frankfort-on-the-Oder as well as his coreligionists who were devoted to Cabala and committed to a blind belief in miracles. M. Bersohn, Tobiasz Kohn, Warsaw, 1872. H. R. F. T. H.